This is info on how to tell if you have an authentic HERMANN-Coburg, written by the Company themselves. HERMANN-Coburg / Hermann Spielwaren are one of the oldest still existing Teddy Bear companies in the world. Their Teddy Bears are designed by the best designers and made by high skilled workers. 1. The green HERMANN-Coburg Hang Tag . 2. The HERMANN Coburg Neckmark. 3. The HERMANN Coburg Fabric Labels. 4. The HERMANN Coburg individual numbering of a Limited Edition. The green HERMANN-Coburg Hang Tag . At the beginning of the Thirties Max Hermann designed for his Teddy Bears the known logo - the "Green Triangle" and "the Bear with the Running Dog". Till today these features have remained in the trademark of Hermann-Coburg to identify all Teddy Bears made by Max Hermann and his descendants. Since the Beginning of the Thirties all Hermann-Coburg Teddy Bears were signed with the traditional green Hermann-Coburg hang tag, which shows the well-known drawing of "the Bear with the Running Dog". The HERMANN Coburg Neckmark . 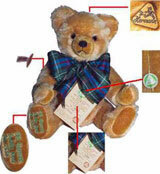 Since August 1993 all Hermann-Coburg Teddy Bears are signed with the Hermann-Coburg "Neckmark", which shows the traditional sign of the "Triangle" containing with the drawing of "the Bear with the Running Dog". This "Neckmark" guarantees the identification of Teddy Bears made by Hermann-Coburg, one of the oldest still existing German Teddy Bear companies, for the future and for all times. You find this neckmarks at the back of the bears head. Check the neckmark and you can be absolutely sure to have a Bear from HERMANN-Coburg. On the other side, this sign helps you to verify the production date before or after August 1993. The HERMANN-Coburg Fabric Labels . HERMANN Coburg Made in Germany. Check these words on the fabric label in right arm, and you can be absolutely sure to have a Bear from HERMANN-Coburg. The HERMANN Coburg Individual Numbering of a Limited Edition. Each limited Hermann-Coburg Teddy Bear bears its own individual Number, not only on the certification, but first of all on the Teddy Bear itself - primary on the foot of the Bear. This guarantees, that every Teddy Bear is registered, and that not more than the limited edition can be produced. Just before the manufacture of a limited edition starts, each Teddy Bear gets its own individual number, which signs this individual Bear during the manufacture, for the future and for all times. Golden Books of HERMANN Coburg. In addition to this, HERMANN-Coburg has so called "Golden Books". Each bear is registered with his number for all times to the person, who gets the bear first. So the HERMANN-Company knows exactly, even in 100 years, at which date the bear has left the company in Coburg and to whom, Teddy Bear Collector or shop, the bear was sent first. This is a big investment from the HERMANN's for the future, that guarantee the value of the HERMANN-Coburg Bear for the Teddy Bear Collector. Of course there are also non limited Teddy Bears in the Collection of HERMANN-Coburg, or there are other form of limited editions, like a limited production to one year, for example the Annual Editions. These Bears are not registered. The HERMANN-Coburg Certification of Authenticity . Each Limited Edition HERMANN-Coburg Teddy Bear has a certification of authenticity. the individual number of the bear. Both numbers , on the bear and on the certification must match. It's very important to compare these two numbers. That is the only way to be sure, that the bear, described on the certification matches with the bear you will buy. There are many other Hermann Bears available, so if you are looking for a particular one that is not shown in our Hermann Bear Store, please let us know and we will send you all the details. HERMANN-Spielwaren GmbH - Coburg, Germany.